The SAP “all-in-one” solutions with global coverage for hotel business operations. Integrated solutions for the reporting and assessment of all operations of a chain. The solution to explode in a fully integrated way with PMS, the online channels for B2C and B2B. More than 380 hotels in 28 countries will transition from a multivendor environment to Indra's unified TMS platform, setting a new course for multi-property technology adaption across the globe. © 2016. Indra Sistemas, S.A. All right reserved. Not only will the TMS suite pave the way to higher levels of guest service and more efficient operations, but it will enable us to access much more accurate guest information from any property, any department, anywhere in the world, and in real time from a single database. Streamlining technology is a step forward in maximizing efficiency across our organization and tightening our bottom line. Due to the open nature of Indra's modular and configurable Travel Management Suite, we are now able to efficiently and effectively make chain-wide policy decisions that keep us competitive, with a quick time-to-market response and a minimum investment. Unified information and one data structure is truly driving our business intelligence, which has contributed to increased guest satisfaction, loyalty and revenues. Indra is dramatically changing the technology landscape, not just by giving hotels an alternative holistic, all-in-one solution for hotel chain management, but by developing modules so comprehensive that they stand on their own - and stand head-and-shoulders above their competition. One of the top 25 hotel chains in the world is directing the future of hotel technology by migrating to an all-in-one, unified platform for hotel chain management. Using Indra’s SAP-based ERP, NH Hotel Group will now operate with an integrated approach to hotel chain management and blend all back-office, front-office and CRS needs on a single technology platform. 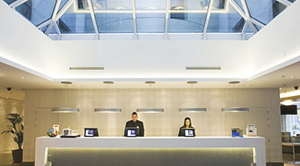 NH Hotel Group, Europe’s third-ranked business hotel chain with close to 400 hotels in 28 countries across Europe, the Americas and Africa, is migrating all key systems to the Indra Travel Management Suite — TMS Platform. This includes transitioning all its core front office solutions, including PMS, CRS, Loyalty, Business Intelligence, Sales & Catering, Spa, Website and CRM. In addition, all back-office administrative systems will be converted to Indra’s TMS for ERP solution based on SAP ERP, covering finance, sales, management control, procurement, asset management, invoicing and HR modules. The brand-wide roll out began in January 2014, in Spain and will extend to more than 20 countries in Europe and America. In the same timeframe Indra will develop and launch NH's new website to make it a key marketing and business generation tool. The new TMSforWeb web platform, based on SDL Tridion CMS, will be optimized to improve the experience of returning hotel guests and to attract new ones. A new loyalty program, NH Hotel Group Rewards, also is being launched in cooperation with Indra, designed to bring the brand closer to its guests and surprise them during each stay with exclusive services and personalized offers. NH Hotel Group Rewards will be powered by the TMS Loyalty module. Alu Rodriguez, NH Hotel Group CIO, said she believes the way to honor the company's commitment to personalized service is to minimize the number of different systems across all NH hotels and replace them with seamless, uniform technology. "This is where Indra comes in," Rodriguez said. "Not only will the TMS suite pave the way to higher levels of guest service and more efficient operations, but it will enable us to access much more accurate guest information from any property, any department, anywhere in the world, and in real time from a single database. The marketing potential is huge when you have such a complete and accurate database. Streamlining technology is a step forward in maximizing efficiency across our organization and tightening our bottom line. We are impressed with the successes other businesses have had with SAP, and we are eager to get started with Indra and begin maximizing results." Indra is the leading Spanish consulting and technology multinational and one of the top companies in Europe and Latin America. SAP is the No. 1-ranked ERP business platform with 25.5 percent worldwide market share. Indra’s TMS solutions support all the business needs of a hotel chain or management company in one comprehensive system, hosted in the cloud or on-premise. Each module of the TMS suite is also available separately, and hoteliers can take advantage of Indra’s unparalleled interface capabilities to integrate these powerful applications with their existing systems from other vendors. Indra is a member of the exclusive club of SAP® Global Partners, composed of approximately 30 multinational providers delivering consulting services for SAP solutions. Indra's SAP expertise, extensive relationship with SAP partners, swift time to market are just part of the reason that NH Hotels decided to move to an all-in-one, fully integrated enterprise solution. The system's flexibility, along with its multinational/multilingual/currency conversion capabilities also spoke volumes. "We are honored to add NH Hotel Group to our global portfolio of hotel customers said Connie Rheams, Indra senior vice president. "When such a large, prestigious global chain recognizes the operations and financial benefits of using one technology platform across its vast enterprise, we believe it will trigger other hoteliers to review their technology investments and strategies. Indra is equipping NH Hotel Group with the most advanced technology available to deliver real-time, 'know-me' experiences. NH will be in a strong position to deliver upon its guests' expectations 100% of the time. 'Real-time segmentation,' 'dynamic offers,' 'personalization,' are not buzz words . . . they are a reality with Indra TMS platform"
About NH Hotel Group NH Hotel Group (www.nh-hotels.com) is Europe’s third-ranked business hotel chain. It operates close to 400 hotels with almost 60,000 rooms across Europe, the Americas and Africa, including top destinations such as Berlin, Madrid, Amsterdam, Paris, London, Rome, Bogota, Mexico City and New York. NH is traded on the Madrid stock exchange. About Indra Company Indra is one of the world's largest consultancy and technology multinationals, a leader in Europe and Latin America and is expanding in other emerging economies, with sales approaching €3,000 million, it employs 42,000 professional and has customers in 128 countries. At the core of Indra’s hospitality practice is its Travel Management Suite (TMS), built on the world-leading SAP technology platform. The TMS services all the business needs of a hotel chain or management company in one comprehensive system, hosted in the cloud or on-premise. It offers unsurpassed functionality for any business area, and it is open, configurable, scalable and modular. Hotels can start with any of the TMS modules and add-on as needed in the future, providing a more custom approach to enterprise management. Indra's "TMS for Hotels" suite provides modules for property management, events (sales & catering), point of sale, loyalty, spa, restaurant, purchasing, finance, etc. These modules can be added over time at the customer's convenience, leveraging the platform and implementation in place. For more information on Indra's hospitality practice, contact Connie Rheams at (214) 554-3851 or email her at crheams@indracompany.com.